WHAT: Celebrate the freedom to give blood this Fourth of July weekend! The American Red Cross will host two blood drives at Mall of Georgia and Town Center at Cobb this Fourth of July weekend from Friday, July 3 through Sunday, July 5. · Blood cannot be manufactured — it can only come from generous donors. · Blood donation is a simple four-step process: registration and medical history, mini-physical, donation and refreshments. · Shortages of all blood types usually occur during the summer and winter holidays—so now is the time to give! · One donation can help save the lives of up to three people! 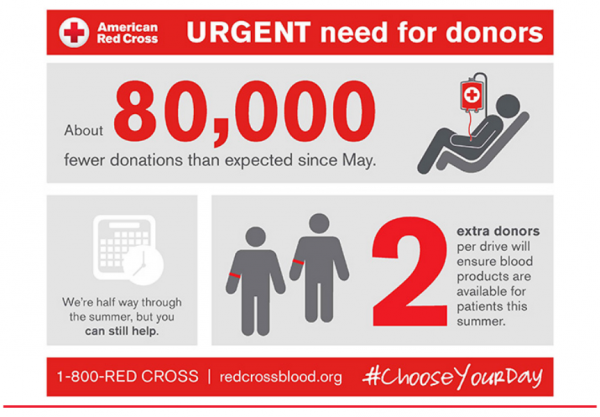 · The American Red Cross supplies approximately 45% of the nation's blood supply. HOW: Log on to http://redcrossblood.org to schedule an appointment in advance. Enter the code ‘moga’ for Mall of Georgia or ‘tcac’ for Town Center at Cobb. For more blood donation facts, visit the American Red Cross online at www.givelife.org.